Nia is a designer at Codesign and has worked extensively with publishers and photographers in the UK, Sri Lanka and India. London is Changing, a project by Rebecca Ross, with assistance from Duarte Carrilho da Graça, provided a public platform for the personal stories of people moving to, or away, from the city of London. It aimed to engage with the public to communicate individual perspectives on the changes affecting London and its residents. Type ‘London’ ‘Social’ ‘Policy’ into a news search these days and you are likely to find articles on the rising cost of living, increasing multimillion-pound apartments continuing to sell to the mega-rich, and the bedroom tax which has increased taxation of some of the poorest of London’s residents. It is not uncommon to read headlines such as “ The reconfiguration of London is akin to social cleansing”. At the same time people continue to relocate to the city, more infact than those leaving. London is Changing is one project which explores the role design can play in understanding this context. Recent changes to the welfare state here are (deliberately) pouring fuel on the fire of a class war. Unjust policies are being authored and implemented by a wealthy elite conservative government. These policies have a more severe impact on the poorest members of society… but they also impact the middle class… It gets especially divisive when bones are tossed to those of us who are more middle class, such as through policies such as help to buy… to keep the chattering class as allies and from being too outspoken. It is difficult for most people to see the aggregate picture of what is going on. Our fates are all connected though and this is all too often under-emphasised or even hidden. I am not an expert on economics or policy but what I pay close attention to is how easy it is in the contemporary climate for policies that benefit the few at the expense of the many to be either packaged as something else or buried in over-complicated rhetoric. I think design has a large part to play in engaging with this condition. 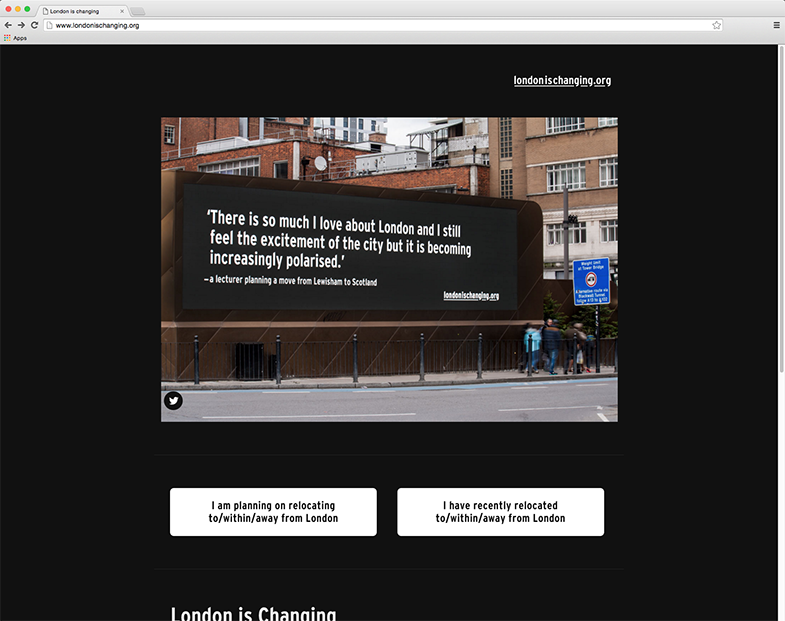 The project consisted of a web platform through which contributors who were either relocating from, or to London, wrote why they moved and how they felt about it. Messages were then selected by the team whose aim was to gather a range of opinions. 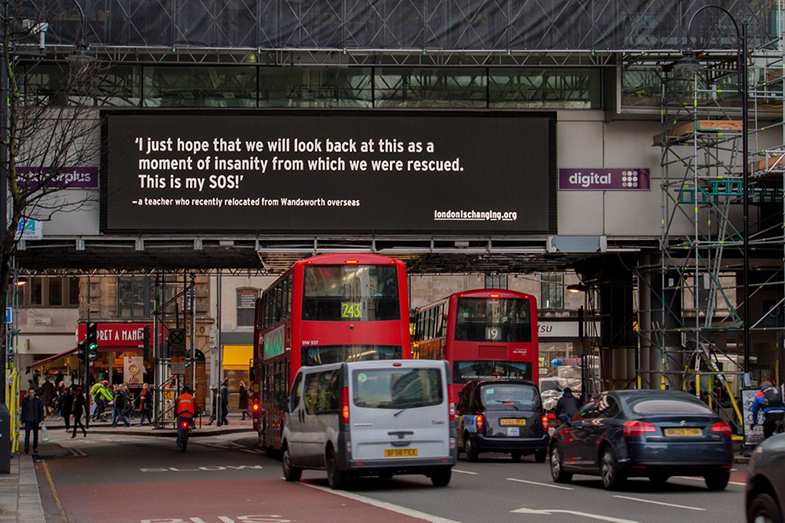 In late February and March of 2015 two electronic billboards in Central London began featuring the selected quotes. The billboards and the web platform were paired down and functional to the point where there was little else but the voice of the writer. This aesthetic meant that each voice was presented equally, as opposed to the ‘loudest’ being heard. The billboards we electronic, meaning they scrolled through multiple messages in space of a minute and could be changed from one day to the next. As different opinions went up they appeared to answer on another — a public dialogue of sorts. The billboard medium is not neutral. It is at the same time ‘public’ — its success depending largely on its visibility in the public domain — and yet monopolised by, and largely synonymous with, commercial interests. Their monumental presence on public space is unmatched by posters or traditional print media communication and these new electronic billboards are more dynamic than ever before, scrolling through multiple messages over time. In the case of London is Changing this meant the texts were seen for about 15 seconds of every minute, placed between conventional advertising campaigns from corporations like Cadbury’s and Facebook. The minimalism of the LIC billboards cut through the slick noise of the conventional corporate advertising, meaning that as well as the being part of the project dialogue they might also viewed in the context of public advertising itself. 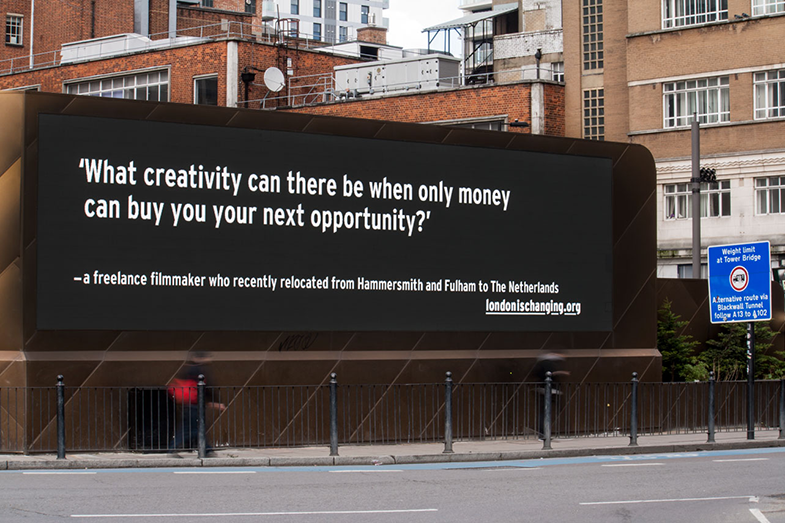 Imagine, for example, a text like, “What creativity can there be when only money can buy your next opportunity?” followed by a Britain is Good for Business campaign. Neither complexity nor over simplification alone moves people towards informed understanding multifaceted issues. What design can do is to engage us and show us a way in, helping us to navigate through an issue, presented from different angles, in order to form become more informed. London is Changing stands as an example of how design can engage with and begin to communicate the conflicts and contradictions that form a fuller picture of what is going on.